24" Tall Pumpkin Head Girl (quilt pattern not included). Body is muslin that is painted and stained. Head Styrofoam ball shaped into pumpkin and covered with a hard coating. Her hands and feet are leaf shaped. Fabric leaf cut outs are stitched across apron and collar is crocheted doily. 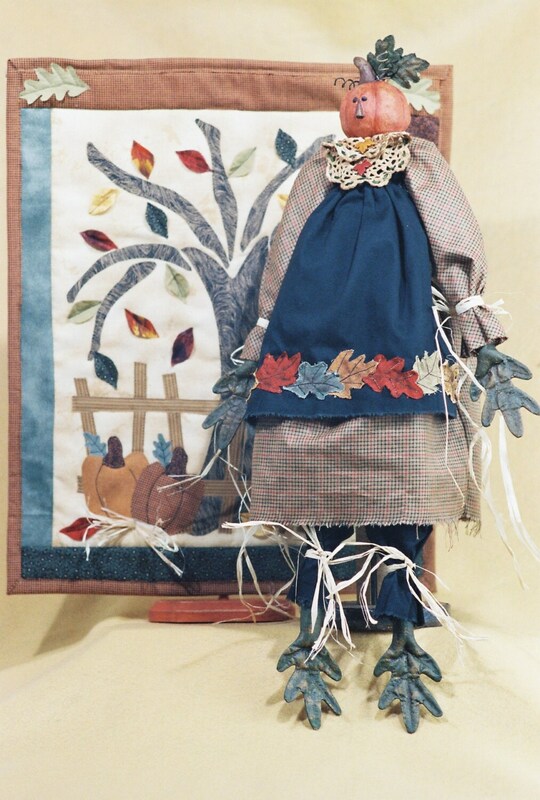 She'll be a perfect addition to your Fall and Thanksgiving décor. Mailed Pattern includes easy to follow instructions, doll pattern, clothing pattern and complete suggested materials list with photo of finished doll.